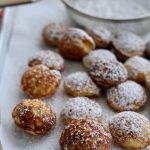 Buttermilk Aebleskivers are a Danish treat, a cross between a pancake and donut without the deep frying! 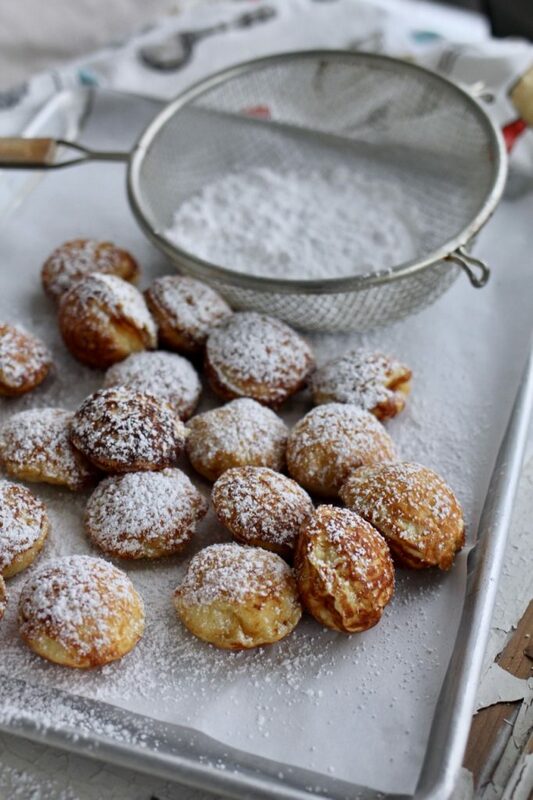 We love to make Buttermilk Aebleskivers on Christmas morning and eat them plain, filled with a little jam or chocolate and sprinkle with powdered sugar. A few years ago, my friend Jill hosted a gathering for the young women in our neighborhood at Christmastime. We spent a good part of the evening eating these delicious Danish Aebleskivers. It was the first time I helped make Aebleskivers and I was amazed at how simple they are to create at home! Most of the ingredients you will have in your pantry and fridge. 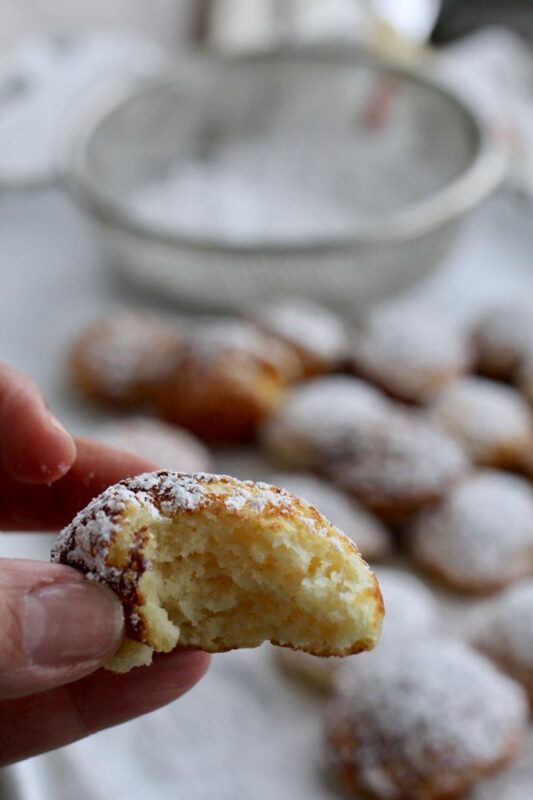 This recipe for Buttermilk Aebleskivers takes minutes to mix up and then it’s just a matter of cooking the batter in an Aebleskiver pan and keeping up with the demand of flipping and sprinkling the Aebleskivers with powdered sugar before they get eaten up! I finally purchased a second pan to speed up the process. We love these hot little pillows of dough with a bit of raspberry jam right out of the pan. Such a fun way to get your family in the kitchen cooking and eating together. Buttermilk Aebleskivers are a perfect Christmas morning treat served with an overnight breakfast casserole, such as Cowboy Christmas Breakfast, Overnight Croissant Breakfast Bake, or Christmas Morning Brioche and Tomato Bake. We also love Mexican Breakfast Tortillas, which can be made the day before as well. Add some fresh fruit and cocoa and you’ll have a Christmas morning tradition your family will look forward to each year! 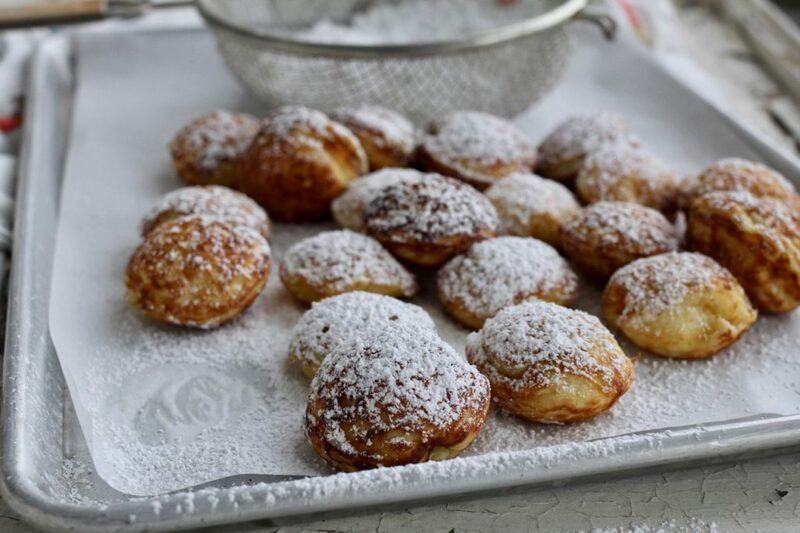 There are many variations to Buttermilk Aebleskivers: chocolate filled or chocolate dough. Add 1/4 cup of unsweetened cocoa powder to the batter and cook as directed. 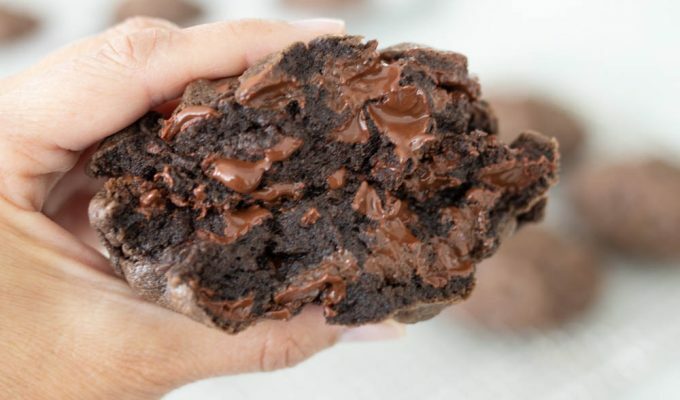 If you want to flavor half of the batter with chocolate, cook about half of the batter and then add two tablespoons of cocoa powder to the remaining batter before cooking. you may also add a few mini chocolate chips or Nutella spread to the middle of the Buttermilk Aebleskivers while they are cooking and then cover with a little more dough before flipping over with wood skewers . If you don’t have wood skewers (sold in most grocery stores, hanging in the baking aisle) you may also use toothpicks! **This post was originally published December 18, 2015 and has been updated to include notes about adding eggs to the recipe, and an update on the second (less expensive) pan purchased. 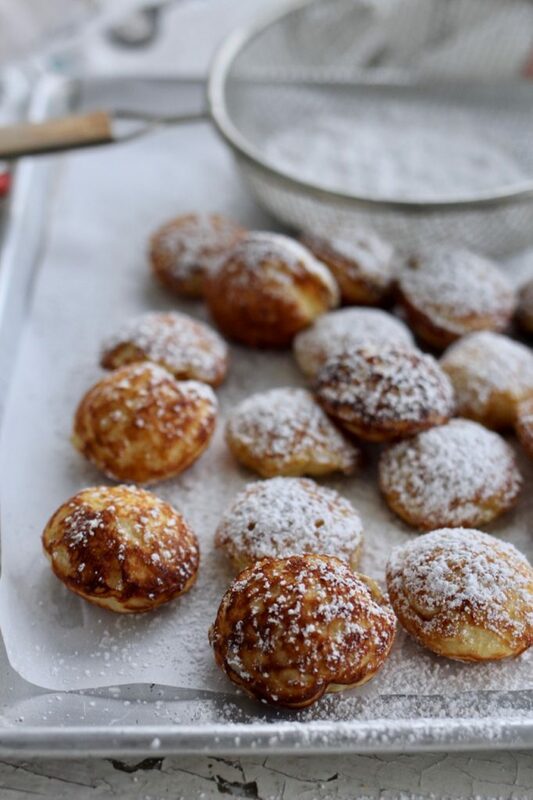 Aebleskivers are light little pillows of pan fried dough, commonly enjoyed in Denmark. This recipe includes the use of buttermilk which makes the aebleskivers extra light and fluffy! In another bowl, combine egg yolks and buttermilk and mix together. Add flour, baking powder, baking soda, salt and sugar all at once. Add melted butter and mix until blended on low speed (I do this by hand with a whisk). Heat an Aebleskiver pan over medium heat, brush each cup with melted butter. Using a 1/4 cup measure, Pour about 2 tablespoons of batter into each cup, and, when bubbly around the edges, turn with a long wooden skewer or toothpick, this takes less than 2 minutes. Continue cooking on the other side until golden. You can test for doneness by removing one of the balls of cooked dough and breaking in half. If you would like to fill the Aebleskiver, you can place about 1 tablespoon of batter in pan, then drop a teaspoon of jam and top with more batter. Serve immediately, sprinkled with powdered sugar, jam and butter. You can skip the step where the eggs are separated, and simply add the eggs one at a time and beat well, but the dough will not have quite the same consistency as when the egg whites are beaten and folded in! I often skip the separation of eggs and just beat the egg before adding to batter. This recipe is easily halved. a half recipe yields about 20 pieces. Best when batter is made right before cooking. This was the worst aebleskivers recipe I have ever tried! The middle of the aebleskivers don’t cook at all and if it somehow magically does cook, then it takes 10 **** minutes! DO NOT TRY THIS RECIPE! Mike, if you have an electric stove with coil burners like mine, the problem might be the thermostats for the burners. If not, and if you are using a cast iron pan, maybe you could lower the heat, and wait for the first side to cook longer before you flip the aebleskivers. Sample one when you think they are done before you remove them all. I hope this helps. Good heavens Mike, you could have asked for help rather that put “do not try this recipe” in big capital letters, jeez! You added 5 stars. So you’re being sarcastic right? I married into a Danish American family and we have made these every Christmas. I lost the original recipe and found yours. 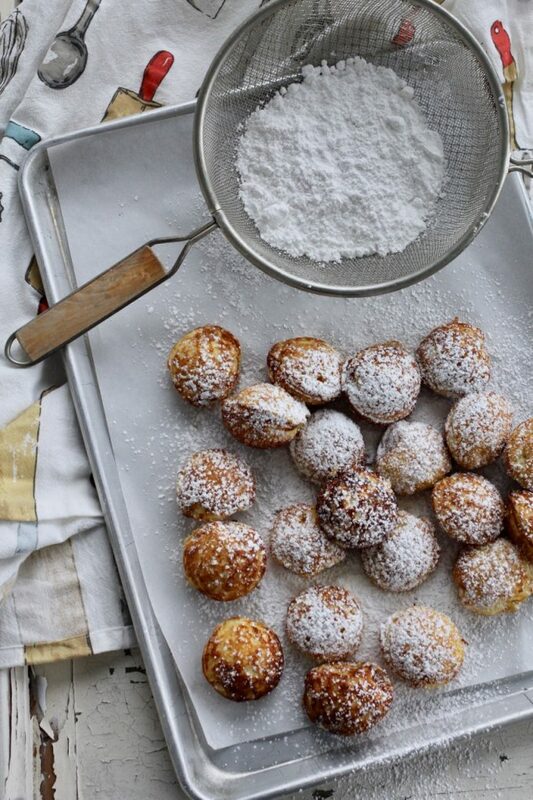 This is the best aebleskiver recipe we’ve tried. It’s a keeper! Thanks for contributing to our Christmas morning! Thank you Jeanne! So happy to hear you love this recipe. AND that you are able to honor your Danish heritage through cooking! This recipe is delicious! The poor review above was most likely because his abelskiver pan was too hot. These aeblskivers are perfect!! Best recipe I’ve ever tried. My great grandmother was Danish. I’ve used her handwritten recipe for years but I won’t ever again. Her’s were dense and heavy. These are light and fluffy! Mine cooked perfectly in the middle. Make sure your pan is not too hot and you will get perfect ableskivers too. Thanks so much Brynne! We love this recipe too. It is the most simple one I have tried, and I agree, the heat is key to cooking perfectly! Made these this morning and they were FANTASTIC. Used a cookie scoop to fill the pan and it was so simple and clean! Definitely replacing my other recipes with this one. Thanks for another great recipe, Si! Great tip! Thanks so much for your comment and recipe rating. I will be using this tip next time I make Aebleskivers! Excellent skivers! Just made these for Easter breakfast and everyone loved them. The recipe made enough for 6 people (4 if my teenage son was home). I tried something new today by preheating my cast iron pan in the oven. This seemed to make for more even heat on the stovetop. Just watch that center divot which is always hottest. Thank you for your positive feedback on this recipe and for your tips for pre-heating. I’m glad you had a wonderful Easter breakfast! I had never heard of these until I came across a man making them at the local market. I decided to try and make them myself so I went out and found a pan and this recipe? Aside from not having anything to compare them to, they came out light, fluffy and delicious. Easy to follow recipe and am very pleased. Thanks for sharing, Alissa. This recipe is such a fun change up from other breakfast treats and I’m so glad you enjoyed them. Thanks for reading ABK! Tried this recipe this past weekend with AMAZING results! By the end I didn’t need to even add butter to my cast iron (on a gas stove) Aebleskivers pan because of the butter in the batter~ I may add some cinnamon or cardamom to the recipe next time. Thank you for sharing! 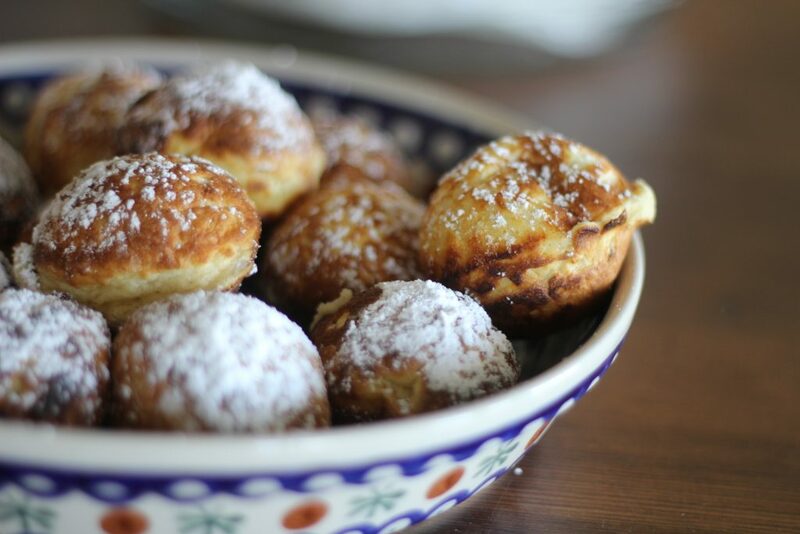 This is now my go-to recipe for Aebelskivers! Love them! Thank you Melissa! I made a batch yesterday and they were gone in minutes. I have an aebleskivers pan! You have inspired me to use it! I am pulling it out this weekend! Thank you! I love your blog! Thanks Carin! I Hope you love this simple recipe. Would love to hear a report back about using your pan! This is the best recipe. We used to use the recipe that came with our pan, but I couldn’t find it. This was by far better. The buttermilk adds a lot of flavor and fluffiness. We added cinnamon and vanilla extract and used blackberry jam, marmalade and chocolate chip. The marmalade was by far the best. Thanks for following along here! I love making these for the holiday season as well. They’re such a special and unique treat. Thanks for sharing, Aimee! This is a great recipe, but your technique needs practice. Yours come out flat. They should be rounded. Don’t be afraid to use enough batter. This recipe makes 3 batches. If you make more than that, you are underfilling your pan. You will have to adjust the heat and add more butter as you rotate turns to create a sphere. Also, add a teaspoon or so of a high heat oil like avocado oil to the butter you are using in your pan so it can take the heat and stay golden. I can send you pics if you’d like to see what they are supposed to look like. Please post new pics after you perfect the sphere so your readers know what they are trying to achieve. Thanks for the advice, Michelle. I’ll make sure to post new pics when I make these again! 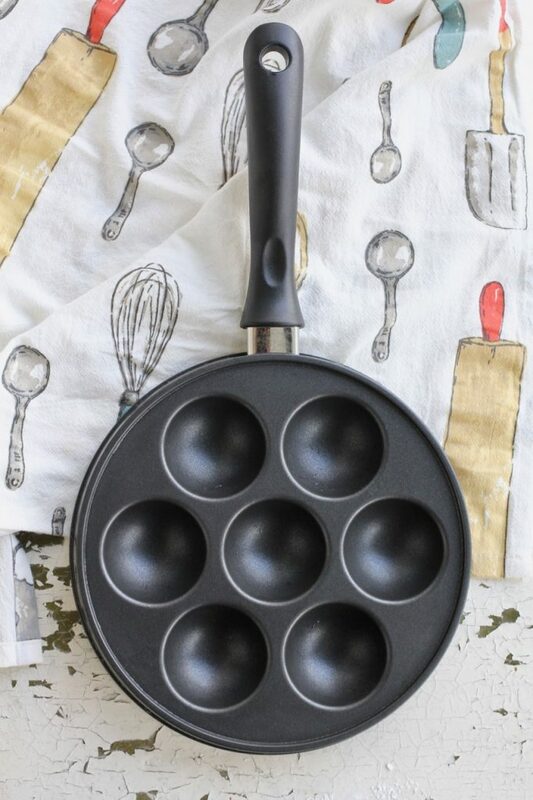 I was given an aebleskiver pan for my wedding by my husbands grandmother that is Danish and we are a military family so I have been dragging this pan all around the country for 10 YEARS and never been brave enough to try to make these “danish pancakes”. So finally I decided this Christmas I wanted to start a new family tradition and thought I would give it try after reading Si’s Instagram post about these buttermilk aebleskivers. And let me tell you what, I have no idea why I was so intimidated by they amazingly easy and delicious little things! This recipe is FABULOUS! They turned out so well and now my kids want them all the time, so I guess I will have to come up with a different thing for Christmas morning because these aebleskivers are now a staple in our breakfast routine and would be a shame to only eat once a year! Thank you for helping me make my Danish ancestors proud!